Entering into a new year often evokes the start of new things, from new lifestyle changes to new shows, and in the political scene, there’s no exception. The ringing in of 2019 is especially important for politics as it is the start of what is likely to be a grueling, yet highly anticipated election process, as the 2020 Presidential Election is right around the corner. Some – especially those with an understandable distaste for current politics – might argue it’s too early to start talking about the 2020 election considering that for one, we just wrapped up the 2018 midterm elections with the official swearing in of new members of Congress on January 3rd, and secondly, the election is over a year and a half away. Yet for others, looking towards the next election is the only thing getting them through the mayhem that is the current presidency. From an ongoing investigation, to members of the administration resigning or being involved in scandals left and right, and most notably the long and drawn out government shutdown, the instability that has defined President Trump’s time in office has left many unsettled and rightly so. Thus, the kickoff to the 2020 election is providing relief in that the chaos could be coming to a close. There’s light at the end of the tunnel, and people are ready to stride through that tunnel – the remainder of this year – to get to the finish line. Moreover, the anticipation for the next election is evident when turning to the amount of attention being given to potential candidates, some who’ve already declared their intent to run, and others who are favorites among the people, but haven’t made any firm announcements. may view a stray towards the center as means to look elsewhere in what is almost guaranteed to be a heated primary. 2) TULSI GABBARD: The first Samoan-American, and the first Hindu elected to Congress, Representative Gabbard, a Democrat of Hawaii, has clear experience in knocking down barriers. The next one she aims to bring down: the presidency, by becoming the first female Commander in Chief. Rep. Gabbard is a combat veteran who served in Iraq and Kuwait as a member of the Hawaiian Army National Guard. Gabbard is a 2020 contender who has already begun campaigning. She has visited both Iowa and New Hampshire – crucial states in presidential elections as the Iowa caucuses and New Hampshire primaries serve as the starting point of a long election race. Yet recently Gabbard is being called a controversial candidate after past ill sentiment towards the LGBTQ+ community were revealed. In the early 2000s, Gabbard worked for an antigay organization led by her father, the Alliance for Traditional Marriage. This week, on January 17th, the Democrat issued a lengthy apology, stating, “In the past, I said and believed things that were wrong, and worse, they were very hurtful to the people in the LGBTQ community and to their loved ones.” The representative cited a conservative upbringing as reason for her former views, and claimed her time in Iraq changed her views significantly. Overall, such controversy so early in her campaign could serve as a setback for Rep. Gabbard, and is likely to be used against her by the numerous other progressive challengers she’s likely to face. 3) JULIAN CASTRO: Julian Castro, the former Secretary of Housing and Urban Development under Barack Obama, and before that, the mayor of San Antonio, Texas, formerly announced his candidacy on January 12th. Castro’s jumping into the race early serves to his benefit, given that his name recognition isn’t as strong as other candidates, or even rumored candidates, and so it’s important he starts to build momentum to remain in this race. 4) JOHN DELANEY: Delaney, a millionaire entrepreneur, businessman, and Maryland congressman, launched a bid in the 2020 election in July of 2017. This extra early start also serves to his advantage since, like Castro, he has little name recognition, (likely less than Castro), and needs the time to build to the same platform other contenders are at. Delaney has also begun campaigning in Iowa, already visiting all 99 counties. income inequality. The Democrat is an active voice for corporate capitalism reform. Warren has visited both Iowa and New Hampshire in recent weeks. Senator Warren received a lot of backlash when she released DNA results to prove that she’s part Native American a couple months back. Many from both sides of the political spectrum viewed the Senator as trying to come off as something she’s not – a member of a minority. The scandal is likely to hurt her campaign. 5) KAMALA HARRIS: Senator Harris of California, an outspoken critic of President Trump, and self-proclaimed voice “For the People” made a formal announcement on Dr. Martin Luther King Jr. Day that she will be running for President in 2020. The Democrat has earned herself a reputation of being firm and holding her own after intense questioning of Trump appointees, most notably Brett Kavanaugh, as well as former members of the Trump administration, such as Jeff Sessions. 6) RICHARD OJEDA: This largely unknown retired Army major and former Democratic state senator of West Virginia, lost in his West Virginia congressional race this past November. Yet the Democrat quickly made the jump for the presidency, declaring he’d be running in 2020 following his loss in the midterm. Ojeda, a candidate who wishes to return to the working-class values that once defined the Democratic Party, has the potential to appeal to a voter base that went for Trump in 2016 – those who are socially conservative but would benefit from left-wing economic policy that emphasizes better redistribution and protecting the common worker. But his lack of experience beyond the West Virginia State Senate and weak name recognition could hold him back. 1) JOE BIDEN: The former Vice President is viewed among many as the candidate who could compete against Trump in 2020, as his blue-collar background and focus built him the reputation as “Middle-Class Joe,” a reputation that could resonate with working-class Trump supporters. Biden himself has stated he believes he is the most qualified Democrat for the presidency, but has yet to make any formal announcement. 2) CORY BOOKER: The New Jersey Senator has only announced he is considering entering into the 2020 race, and is expected to make a decision early this year. Booker has taken early steps indicating a bid, including visiting New Hampshire and Iowa and an extensive search for a campaign manager. worry for most politicians, given the typical ruthless nature they embody. If anything, Booker might make a great running mate choice for Gillibrand. 3) MICHAEL BLOOMBERG: The former mayor of New York City and recently turned Democrat (again) has been generating heat as a possible contender. The billionaire poured $100 million dollars into the midterm elections to help Democrats get elected, and stated earlier this year that a 2020 run was a possibility. 4) SHERROD BROWN: This Ohio Senator cruised to re-election in November, and did so as a Democrat in a coveted battleground state. As a result, much focus has been centered on him as a possible competitor of Trump’s next year. Brown’s success in a state that has swung more Red than Blue in past elections certainly works in his favor, and he is expected to release his final decision in the coming weeks. 5) BETO O’ROURKE: After a hard fought battle against Senator Ted Cruz in November, Beto O’Rourke, the former El Paso Congressman, gained national recognition for making a traditionally Republican-held seat, and one occupied by a well-known incumbent, competitive. O’Rourke also generated an astounding grassroots movement, with diehard supports nationwide who are urging him to go for the presidency. The Democrat has yet to make any final decisions about a possible bid. 6) BERNIE SANDERS: The famous Vermont Senator and self-declared Democratic Socialist may be coming around again after losing the Democratic nomination in 2016. If Sanders does choose to enter the race, he is expected to be a front-runner in the already large pool of candidates. All in all, the 2020 Presidential Election is undoubtedly highly anticipated, and is gearing up to be historical. Roughly half a dozen candidates have entered a bid, and many more are expected to make final decisions in the coming weeks. 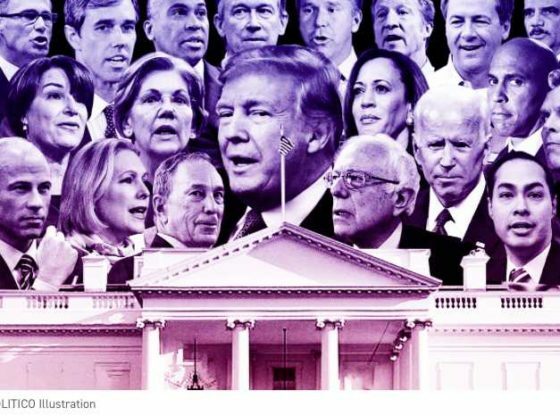 The election may very well be the most crowded arena ever as various candidates believe they are the best ones to first oust President Trump, who seems to have plans for reelection, and then perform the role of Commander in Chief. But in an era of divisive politics that citizens are growing more distasteful of every day, the large number of Democratic contenders vying for the same spot could create a rift in the party, and more division is the last thing needed right now. There must be caution and civility in how these Democrats go about their primary, or risk isolating more voters from the political process – something that can’t be afforded in a pivotal election.